AKRON, Ohio – Small businesses in the cities of Warren and Akron will benefit from a partnership being launched by e-commerce giant eBay. Devin Wenig, eBay CEO, was at Akron’s Northside Marketplace this morning, where he announced the two cities would be the U.S. pilot communities for the company’s Retail Revival program. Partnering with the City of Akron, Ohio, eBay will empower local entrepreneurs to harness the power of technology and ecommerce. “This program exists to help small local businesses and the broader community harness the power of technology and participate in the global marketplace. Retail Revival will provide Akron startups and established retailers alike with wraparound support services, training and marketing to expand their businesses through the eBay platform.”. By Jim Mackinnon. The 12-month pilot program, called Retail Revival, was announced Friday morning by Akron Mayor Dan Horrigan and eBay Inc. President and CEO Devin Wenig. 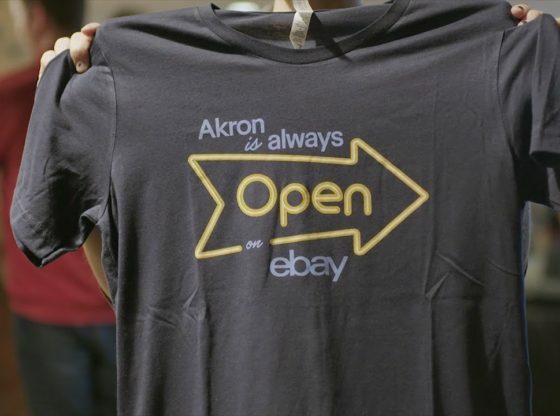 Akron is the first U.S. city selected by eBay to take part in Retail Revival. “We decided Akron was the place to try something really new,” said Wenig, eBay CEO since 2015.